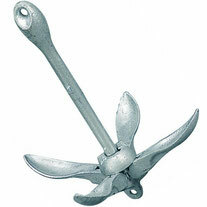 Poor holding versus other anchors. 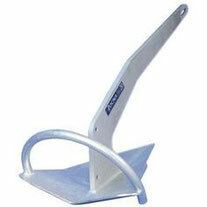 A fixed version of the plough - useful in combination with a bow roller. Description: Single sided full colour teaching flash card, with blank section on reverse for your own teaching notes & prompts. Chain & Warp = 6x depth of water. Chain only = 4x depth of water. 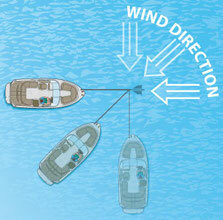 Always take into account the 'swing zone' which can be impacted by wind or tide. 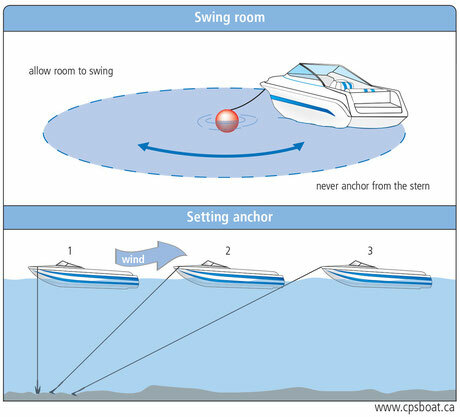 Vessels move around their own swing zone at different rates according to their weight, freeboard and hull/keel depth. Look for a sheltered anchorage. Take a trial run to assess depth, and allow for a falling tide. Avoid main channels and submarine power lines; use charts to identify areas. Prepare the anchor line and anchor. How much rope and chain needs to be put out? Check charts for obstructions and what ground to expect. 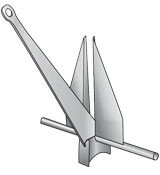 The anchor is connected to a ‘scope’ of chain, or a chain and rope combination. 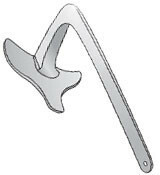 The amount of scope let out when anchoring depends on whether the scope is all chain or a mixture. 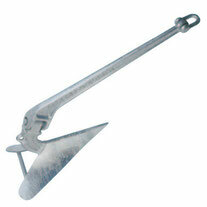 The more scope you let out reduces the chances of the boat snatching the anchor out of the seabed. It also acts as a shock absorber. If in a tidal area you need to allow for the rise of tide in your calculations. The amount of scope carried on board depends on your area of operation. In shallow estuaries 30m would be sufficient whereas in deep and rocky areas considerably more may be required. 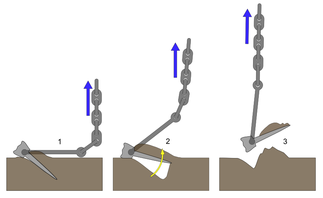 The process of anchoring is very similar to picking up a mooring buoy. RIBs and speedboats with open bows are easier to anchor, because going forward is easy. On larger craft with anchor lockers at the bow, a crew member must go onto the foredeck to anchor but with caution, keeping their centre of gravity low. Approach chosen anchor point in same direction as you would for a mooring buoy. When at the chosen point stop the boat. Drop the anchor to the seabed. 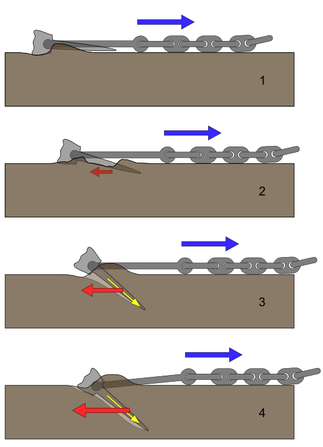 As vessel drifts back, ease out scope to 4:1 (all chain) or 6:1 (rope chain) ratio. Make fast and engage reverse briefly to dig the anchor in. Identifying a transit and checking it at regular intervals. Setting up the anchor-drag function on your GPS. Taking a bearing from a hand bearing compass. If the objects in transit cease to be lined up or the bearing changes, you are dragging. If your anchor is dragging, you will need to raise it and re-anchor. If it continues to drag, choose a different anchorage. Identifying a transit and checking it at regular intervals. Setting up the anchor-drag function on your GPS. If it continues to drag choose a different anchorage. Check to see how the boat is lying. 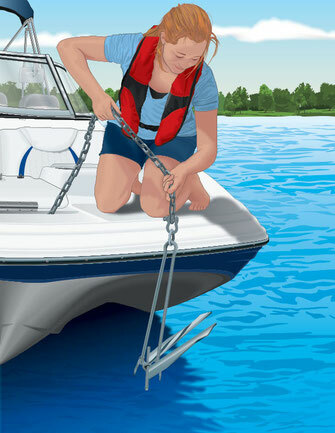 If the boat is pulling back away from the anchor, you may need to slowly motor towards the anchor as the crew pulls in the slack and raises the anchor. Good crew communication is essential to avoid overrunning and fouling the prop. Hand signals between crew and helmsman are useful. 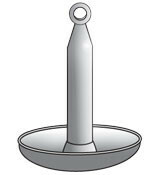 Bring the anchor and line on-board, and stow it away so it is ready for immediate redeployment.